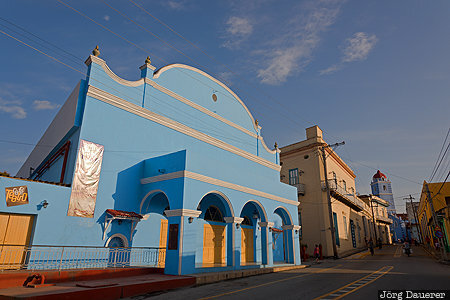 The blue facade of the Teatro Principal de Sancti Spiritus below a blue shy illuminated by warm morning light. Sancti Spíritus is in the province Sancti Spíritus in the south of the Caribbean island of Cuba. This photo was taken in the morning of a sunny day in March of 2016. This photo is in the Photo Calendar "Kuba". This photo was taken with a digital camera.